Back in December, there was seemingly no NHL season in sight. 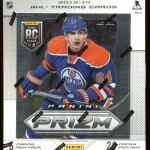 But that didn’t stop Upper Deck from releasing their 2012-13 Black Diamond set. This set has no redemption cards–just base cards, short-prints (at various levels of scarcity), and jersey cards (and we KNOW what I generally think of those). You might pull an autographed card, but at 1 in every 60 packs, your odds aren’t the greatest. A box will cost you roughly between $90 to $110, and contains 24 five-card packs. 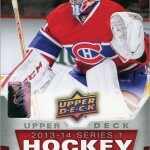 Also included is a 25th “Bonus Pack” which has 5 cards from 2012-13 Upper Deck Ice. 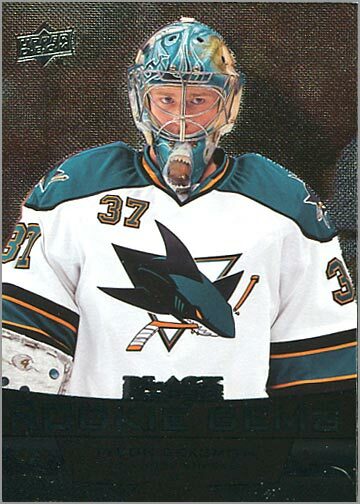 By the way, these cards are all metallic-y, so they do not scan too well. 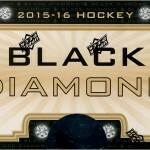 102 base cards – One nice thing about Black Diamond is that the collation seems pretty good. The base set contains 100 cards, and the box yielded 102 base cards. This box was a best-case scenario, as I was able to put together a complete base set with only 2 duplicate cards left over. This is encouraging for someone who wants to take a chance on maybe getting a few “hits” and walk away with a complete base set in the process. I pulled 19 various “hits:. 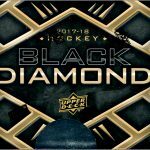 6 Double Diamond short prints – Gilbert Perrault, Brendan Smith, Anze Kopitar, Jacob Markstrom, Paul Coffey and Marian Hossa. Really, Brendan Smith? Jacob Markstrom? A few of these guys do not really seem like “Double Diamond” material to me. 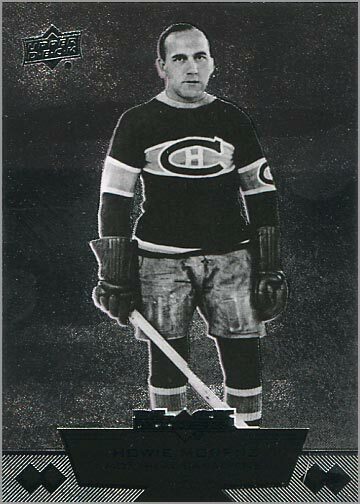 3 Triple Diamond short prints – Mike Gartner, Tony Esposito and Howe Morenz. Now this is more like it. 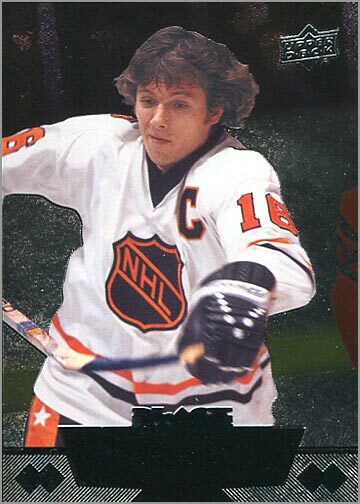 1 Quadruple Diamond short print – Bobby Clarke, sporting an oldschool All-Star Game jersey. 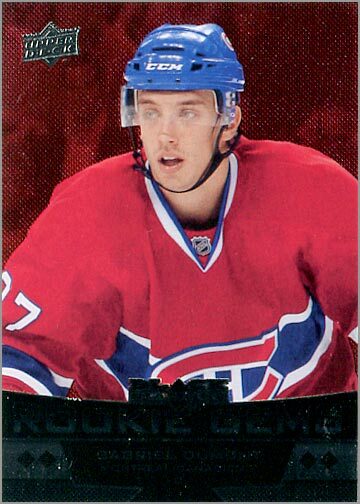 I don’t think I’ve seen this picture on a trading card before, if ever. 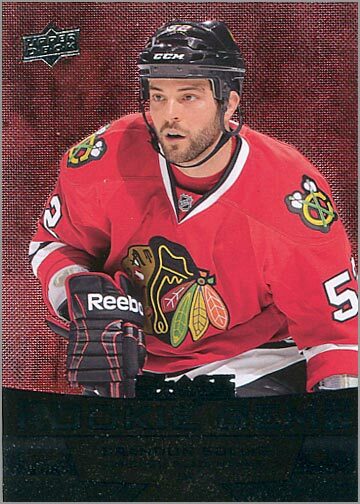 3 Triple Diamond Rookie Card short prints – Dalton Prout, Ryan Garbutt and Tyson Sexsmith. 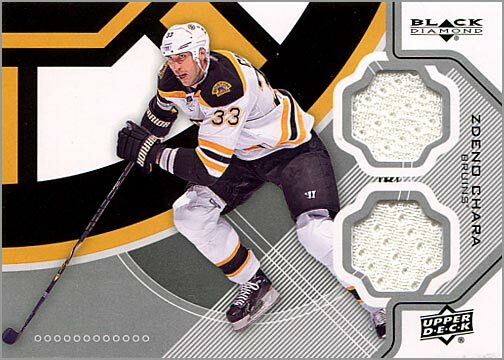 2 Double Diamond Jersey Cards – Zdeno Chara and Chris Stewart. The jersey cards have an interesting design. Each team has 4 cards that can be put together to form a larger picture of the team logo. These look cool when you get all 4 from the same team. 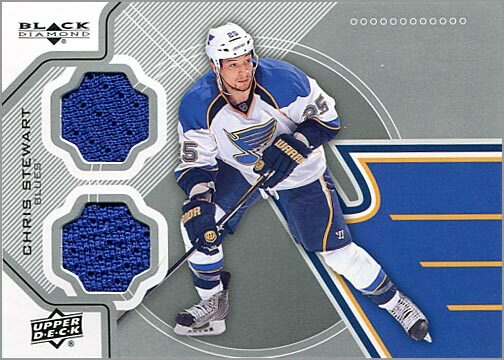 However, I don’t quite understand why Upper Deck would put two swatches OF THE SAME COLOR on the same card. 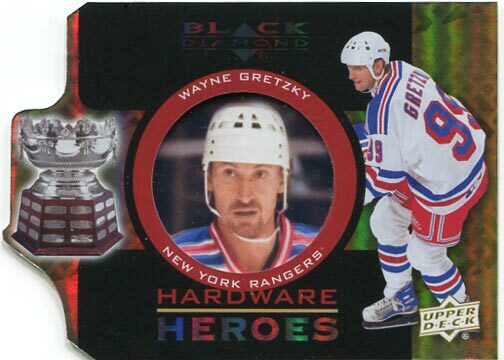 Wayne Gretzky Hardware Heroes Card – This card takes every gimmick and throws it together–but I like it. The Hardware Heroes insert set combines shiny lettering printed on foil board, a die-cut edge, serial-numbering and a center portrait printed on acetate. The headshot of Gretz reminds me of those slides that used to come with the Star Wars action figures in the late 1990s, if you remember those. 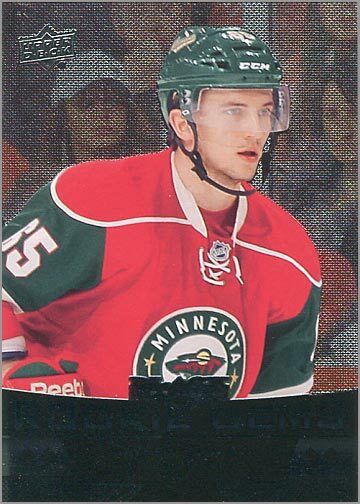 Hardware Heroes come 1 in every 288 packs, so I feel pretty lucky to pull one–even if it shows The Great One as a Ranger (he will always be a King in my heart). 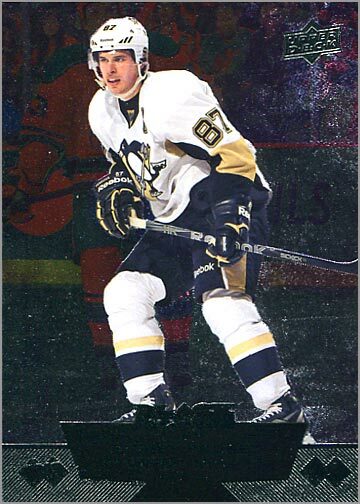 BONUS PACK – The 25th pack contained cards from Upper Deck Ice, as sort of a “set-within-a-set” (think Victory Update in Upper Deck Series 2). 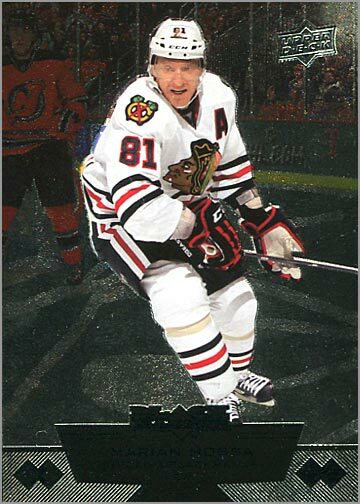 4 Ice “veterans” cards – Dany Heatly, Daniel Sedin, John Tavares and Jarome Iginla. 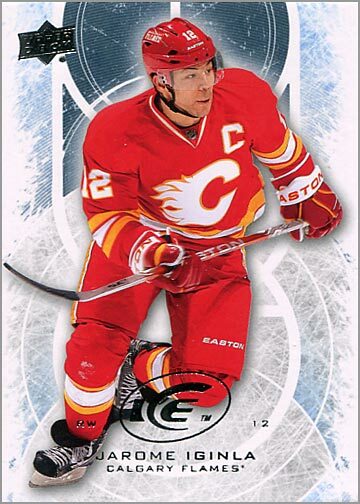 I like the Iggy card the best since it shows him in the oldschool Flames uniform, circa 1990. 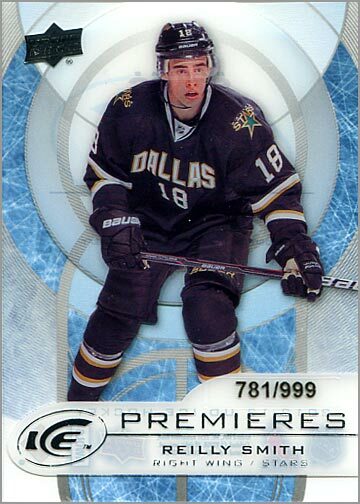 1 “Ice Premieres” Rookie Card – Reilly Smith. As you can see, it is serial-numbered out of 999. It is also printed on “see through” plastic, like past Ice cards, which gives it an interesting look and a sturdy feel. 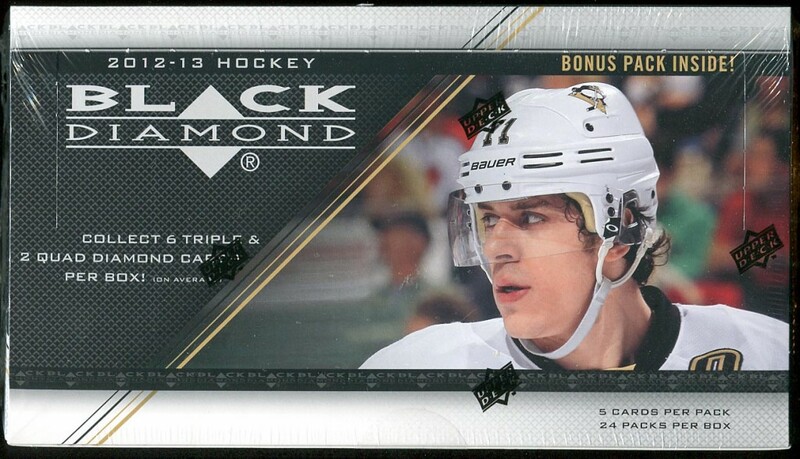 Black Diamond might be worth a shot if you like shiny cards and want a relatively easy base set to put together.With only 100 base cards, you only need a box to build it. Getting the entire set–including all Double, Triple and Quadruple Diamonds–will be a challenge, though. It could be worthwhile if you like jersey cards, or if you want to try and get an autographed card, a Hardware Heroes card or another tough pull. Special thanks to Upper Deck for providing the box for this break. The Great One, always a King? Not an Oiler……maybe my age is showing, but i was at the game in Buffalo when he scored his 77th to break Phil Espisito’s …that team was amazing and forever he will be associated with the Oilers for me. Welcome, Tim. I did not get into hockey until a few months after Gretzky was traded to the Kings. So, his Oilers years were before my time. The Blackahwks, as well as nationally-broadcasted NHL games, were only on cable TV in the 1980s in Chicago. So, I never saw an NHL game until 1989, when Gretzky was with the Kings. Also, it was very cool that you were at that game!